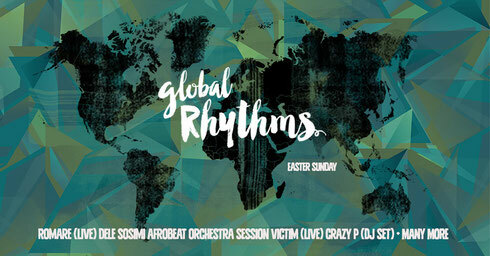 Global Rhythms will be taking over Brixton this Easter Sunday 27 March 2016 for the afrobeat meets house party’s first ever day and night event. The daytime event sees the brand hosting POP Box Brixton, alongside pop-up cocktail bars and food vendors, whereby al fresco dancing will continue until dusk, when the whole shebang moves over to Electric Brixton for a live music and DJ party. The impressive line up at the Electric includes live performances by Romare, Dele Sosimi Afrobeat Orchestra, Session Victim, as well as DJ sets by Crazy P, Bradley Zero and more. Boiler Room’s Romare returns to perform at Global Rhythms after he played at their first gig in January, and will be headlining the show this time around for his second ever live gig. He will be joined on stage by Dele Sosimi Afrobeat Orchestra. Dele is known for having played alongside Fela Kuti as part of the man's Egypt 80 band, where he was both keys player and musical director, and subsequently with Femi Kuti's Positive Force. He is now based in London and directs his own afrobeat orchestra with whom he has performed worldwide including gigs at London's Jazz café and South Bank, Montreux Jazz Festival, Womad, Mostly Jazz Festival and leading a large contingent of jazz musicians in celebrating the musical legacy of Fela Kuti at the Copenhagen Jazz Festival. Dele’s orchestra presents rhythm guitars, percussion, call and response vocals, and horns - faithful to the original blueprint but also bearing Dele's own DNA. Some will already have come across the Âme Innervisions release of his song ‘Too Much Information’, which is reputed to be both Âme & Dixon’s track of the year. As well as live acts, Berlin's Session Victim will also be performing. Their live set fuses house, jazz and funk into one groove blend. DJ support comes from Crazy P, Bradley Zero, YAM Records, Container Records and First World Records alongside Global Rhythms’ residents Elwood and Sam & Toby.